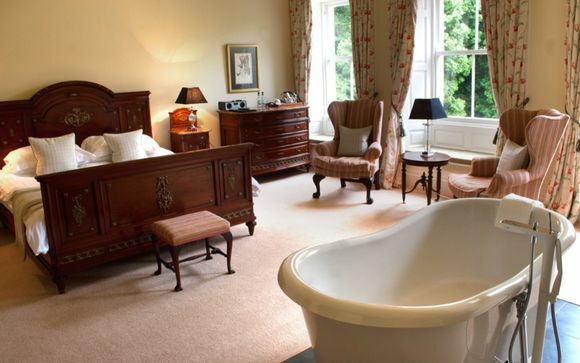 An elegant Georgian country house hotel, where the bedrooms boast indulgent features such as four poster beds and deep soaking, freestanding bathtubs. Close to the beautiful countryside of Northumberland National Park, dramatic coastline and Alnwick Castle - the film set for Harry Potter and Downton Abbey! Enjoy a glass of Prosecco on arrival and a discount on Afternoon Tea. This charming country house hotel is located just outside the market town of Morpeth, and 30 minutes drive from Newcastle. Surrounded by spectacular unspoiled scenery, this is a great choice for those seeking relaxation and tranquillity. Head for the rolling hills of Northumberland National Park (22 miles), or visit iconic Alnwick Castle (14 miles) - the film set for Harry Potter and Downton Abbey. You can even catch a glimpse of the aurora borealis if you are visiting between December and April! 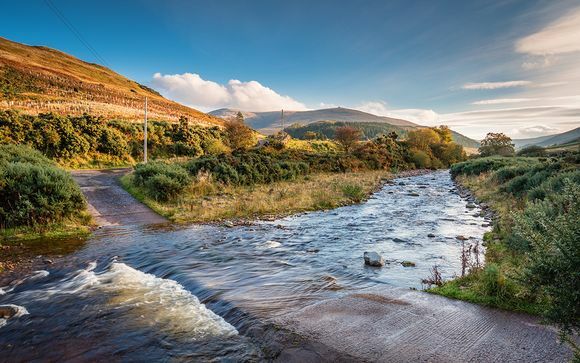 In the other direction is the dramatic coastline where those who are brave enough to face the chilly sea temperatures can enjoy watersports, and nature enthusiasts can book boat trips to view grey seals. There are a range of golf courses nearby, the closest is Macdonald Linden Hall Golf and Country Club (7 miles.) Guests can also make use of the spa facilities at nearby sister hotel, Doxford Hall( 20 miles). A Georgian country house, it charms with all the essentials: a creeper-covered façade; window seats; panelled walls; plasterwork ceilings; and a walled kitchen garden....Watching the wildlife – pheasants, deer plus red squirrels, if you’re lucky – through the huge sash windows is a treat. A country house hotel with beautiful grounds, this grand Georgian manor house feels impressively elegant yet retains a homely and welcoming atmosphere. With just 11 bedrooms, the service is attentive and personal, with a real home from home feel. Each of the bedrooms is individually styled and spacious, and all have wonderful views over the grounds. There is an elegant lounge and cosy library with open fire, as well as a 2 AA rosette awarded restaurant. You may choose from a Luxury Double Room or a Deluxe Room. 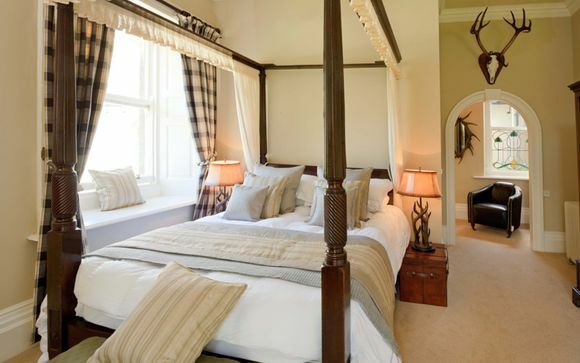 These individually designed bedrooms have magnificent views over the grounds of the estate. They feature a king sized bed, (some four poster), fluffy bathrobes, kettle with a selection of teas, coffee and biscuits, and an LCD television. The spacious en suite bathrooms have large walk-in showers and locally produced luxury toiletries. As above, with a more spacious layout and most rooms with a deep soaking bathtub as well as shower. 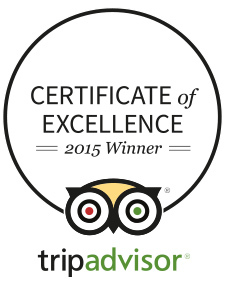 Just for you: A glass of Prosecco on arrival, and a 10% discount on Afternoon Tea. The 2 AA Rosette Restaurant serves fresh seasonal cuisine, with ingredients from local suppliers and the hotel's own kitchen garden. Indulgent Afternoon Teas can be enjoyed from 3-5pm, and feature homemade sweet and savoury scones , finger sandwiches and cakes - the perfect way to refuel after a day out in the fresh air! The closest train stations are Morpeth (9 miles) or Newscastle (28 miles).